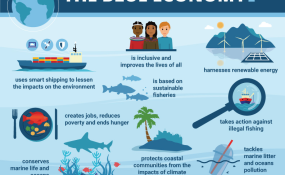 Cape Town — The Blue Economy is about all activities that make sure we use the ocean sustainably while pursuing economic growth, improved livelihoods and jobs, and a healthy ocean, says the World Bank. This could be areas such as renewable energy, transportation routes, food, and labour. - 90% of global trade is carried by sea and will double by 2030". The world's oceans are central to culture, our food, our health and our economies.